A source of information to you from the recognition and development of your initial needs, through specification planning, to the purchase and installation process. Use our resource and training center to assist in making the most educated foodservice equipment choices. Assisting in identifying the application needs. Providing written specifications when replacing or adding equipment according to menu demands, and coordinate your purchasing with a local Equipment Dealer. 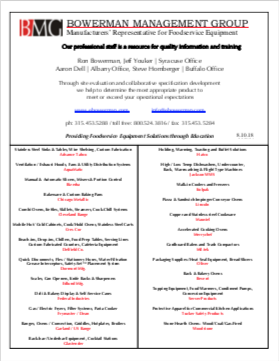 Can assist you in selecting a local Foodservice Consultant for a complete layout and design. Please contact us to request an equipment presentation. Please contact us to request an educational seminar. Our authorized professional service agencies participate in ongoing training to maintain expert knowledge of today’s food service equipment. Many of our manufacturers have instituted a STAR certification program (Standards, Training, Approval and Response), which ensures standards are upheld. We provide a meeting and training facility for our authorized service agents at our Liverpool office (located minutes from the NYS thruway and downtown Syracuse). Please contact us to request information on technical training.